Domesticated ducks are kept for meat, eggs and down. Many ducks are also kept for show, as pets or for their ornamental value. 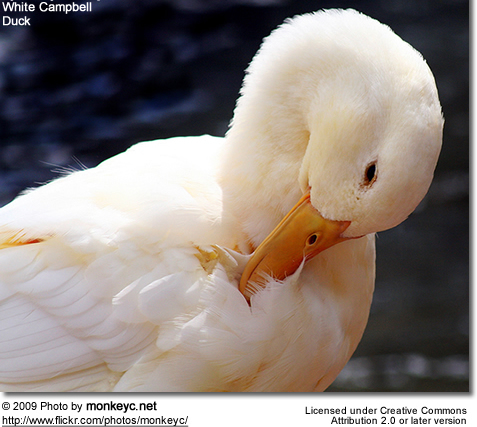 The life expectancy of domestic ducks kept as pets is 8 to 12 years. Most domesticated ducks originated from the wild Mallard Anas platyrhynchos, while a minority are descendants of the Muscovy Duck. Duck breeds are officially recognized for showing by governing bodies of enthusiasts such as the American Poultry Association, which usually administer breed standards such as the Standard of Perfection. There are many existing breeds with more being created today. Most domesticated breeds are descendants from the wild Mallard with exception of the Muscovy. Breeds are sorted into size classes. Below are breeds accepted by the American Poultry Association. There are several ways to tell if a duck is a female or a drake. They can be sexed by voice when their voice changes at 4 to 5 weeks old. Females have a loud quack which ducks are known for. Drakes, however, have a raspy quiet quack. Depending on the breed and variety, drakes have different plumage than females. Day-old ducklings can be sexed by looking inside their vents, but if this is done incorrectly it can hurt or possibly kill the duckling. Sometimes drakes have curly tail feathers and female ducks have straight tail feathers. Ducks have been farmed for hundreds of years. They are not as popular as the chicken, because chickens have much more white lean meat and are easier to keep confined. Nevertheless, the duck is a popular and well known farm bird. Ducks are farmed for their meat, eggs, and down. Their eggs are bluey green to white depending on the breed. Ducks can be kept free range, in cages, or in batteries. To be healthy, ducks should be allowed access to water, though battery ducks are often denied this. They should be fed a grain and insect diet. Its a popular misconception that ducks should be fed bread; bread has no nutritional value and can be deadly when fed to developing ducklings. The females of most breeds of domestic duck are very unreliable at sitting their eggs and raising their young, and it has been the custom on farms for centuries to put duck eggs under a broody hen for hatching; nowadays incubators are usually used. However, young ducklings rely on their mother for a supply of preen oil to make them waterproof, and a hen does not make as much preen oil as a duck; and an incubator makes none. Ducks can be kept as pets. They can be kept in a garden or backyard and will often eat insects and slugs. A pond or water dish is recommended although they will probably dredge out and eat any wildlife and frogspawn in a pond, and even swallow adult frogs and toads, as they have been bred to much bigger than wild ducks with a "hull length" (base of neck to base of tail) up to a foot or more. A coop should be provided for shelter, and for safety at night from predators such as foxes, as their size makes them unable to fly properly. Ducks are also kept for their ornamental value. Breeds have been developed with crests and tufts or striking plumage. Shows are held in which ducks can be displayed. Copyright: Wikipedia. This article is licensed under the GNU Free Documentation License. It uses material from Wikipedia.org ... Info added by Avianweb.